By Kate Harrison, published by Indigo (Orion). Goodreads synopsis: Someone is stalking Alice Forster. She’s sure it’s her sister’s murderer, but her parents think she’s cracking under the stress of Meggie’s death. Only in the virtual world of Soul Beach – an online paradise for the young, the beautiful and the dead – can Alice feel truly free. But there’s trouble in paradise . . . I need to calm down and breathe for a second. After three years of absolutely loving this trilogy as it’s progressed, I finally know who killed Alice Forster. Wow. I was most definitely not expecting that! And the reveal of the killer was so clever. flawless. And genius. This book has got to be the best crime based thriller that I’ve ever read, honestly! After two amazing books full of unexpected twists previously, I was really looking forward to seeing what this one had in store! This final story of the trilogy was absolutely amazing. It blew me away. I began it, thinking I’ll just read a chapter now, then finish some other things and come back to it later but I got absolutely hooked on it! I honestly found it hard to put the book down, and when I had to I did so very reluctantly. The story was so real, as the book began with events like Meggie attempting to drive. Then, she made a return to the virtual hangout for the dead beautiful (oh. The pun.) and strange things begin to happen on the virtual heaven. Really strange things! So used to reading about the sunny paradise, I gasped when a Storm tore through it, and was left on the edge of my seat eager for answers. Totally engrossed, I sped through the book, eager to find out who the killer really was! Right up until the page on which they’re revealed, I was guessing. Guessing wrong, I’ll put. Kate kept me totally in the dark as to who the murderer was throughout the whole trilogy- and even in the scene where they’re revealed. The plot was very misleading thanks to some investigations by Meggie: It threw me right off of the trail! the writing for Soul Storm was amazing. There was a lot of brilliant imagery, of Soul Beach and the country that Meggie winds up in for the last part of the book (Great link to Soul Beach and this country, by the way!). I really felt like I was there, by Meggie; investigating into her sister’s murder, following misleading trails, and I even got a shiver up my spine when the killer was revealed. So real. Also, not only was the normal writing fantastic, but there’s also the short paragraphs after every few chapters! Over the trilogy there have been short passages from the POV of the serial killer, and wow, were they chilling. Somehow, Kate’s managed to keep these terrifying, while also keeping them so vague that I had no way to track it back to the guilty character. Kate Harrison is a crime writing genius. ‘Nuff said. Meggie, as before, delivered as a protagonist. She was easily likeable, and I loved following her investigations immensely. She was determined, eager to bring justice over the murder of her innocent Sister. Even when banned from the internet after her mum gets concerned, she finds a way to contact her dead sister, who’s always waiting on Soul Beach; to update her on her leads. She was just so caring, and I loved that! I also really enjoyed seeing Meggie and Lewis become closer, and how Lewis revealed a past linking Alice (Meggie’s sister) to himself. Very clever, because it made him a suspect, as well as Sahara, who was top of the list for Meggie. All of the suspects, on that note, had left trails that could have been linked to Alice’s death, which made it really hard for me to decide on who did it! The paranormal twist to this book made it oh so emotional, especially right at the end, where Meggie has to part with Alice as she is laid to rest. I admit it: I let a few tears fall. But who couldn’t? That scene was so beautifully written… so emotional! I think that that was one of the most beautiful scenes I’ve ever read, and I’m pretty sure it’ll be hard to forget the powerful imagery that evoked. 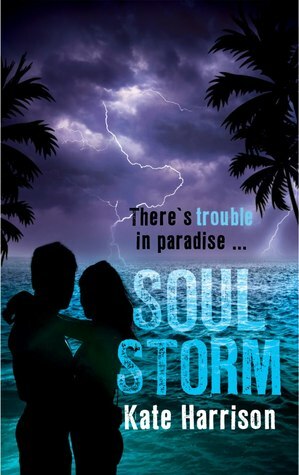 I received a copy of Soul Storm from the publisher in exchange for a review. In no way at all did this affect my thoughts. This entry was posted in Uncategorized on August 1, 2013 by keithbwalters. This looks sooo good!! I haven’t really read a paranormal thriller before, and I love how you had no idea who the killer was! Sometimes plots like that are too predictable. Soul Storm seems overall amazing, from your review, so glad you enjoyed it! It is really, really good! Before the SOUL trilogy, I hadn’t either. Awww….I’m scared. So scared. Seriously. So why am I scared? Because my favourite character is most probably the murderer. 😦 I read the first pages of the new book at amazon and now I’m even more convinced. Even though everyone but Alice, Cara and her parents seems suspicious at one point or another. Actually I hope it’s Sahara’s boyfriend.^^ Because when he was first introduced Meggie thought he didn’t look like a killer at all…and I don’t like him. Sorry for this most confusing comment and my crappy English. I just saw that Kate Harrison retweetet this review, read it…and needed to get this out of my head. Aha, just read your other comment. I’m glad you liked my review, and I agree- brilliantly written! I just dared to read it, because Kate Harrison thanked you for not giving away too much. It’s very well written and I’m glad to see there are other people who enjoyed these books as much as I did.